So there’s this student, Keegan Longueira who really enjoys cycle expeditions. Both in December 2011 and in December 2012 he cycled Witbank to Cape Town and he’s planning another ‘Cape Trek Project’ for this December… and then a really big expedition for next year – to cycle from Cairo to Cape Town AND to break the existing record of 71 days! 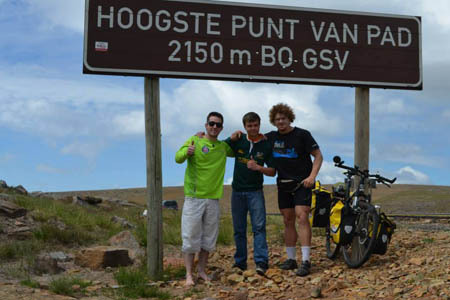 Keegan’s first ‘Cape Trek’ happened in 2011 when he cycled alone from Witbank to Cape Town in 22 days. In December 2012 he was joined by former junior professional cyclist Gert Janse van Rensberg for this 1,800-kilometre ride. They had only two weeks to complete the ride. You can read more about their adventure in this article on Do It Now’s website. Keegan’s Facebook page is ‘CapeTrek‘.